For the 2010 we are proud to introduce the NEW carbon Cross frame, the PRESTIGE. This new cross frame has been developed with the input from former World Champion, 9 time Super Prestige winner Sven Nys. The front triangle is a HHM (High Modulus carbon) monocoque with polygonal section on the top- and down tube, it has a curve between the inside of the top and seat tube, this for better comfort when carrying the bike on the shoulder. The rear triangle is lugged. 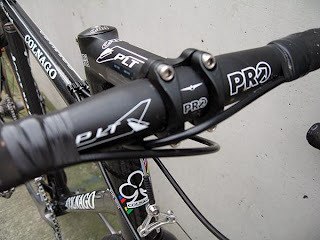 Stability, speed and weight are key components to the PRESTIGE. The PRESTIGE will be available in 6 sizes, (50 to 60 with). Beefier than the C-50's and the first advancement I've seen of their carbon cross mainstay for a decade. I'll take my Ridley X-Night's though any day in a head to head beauty contest. I'm probably just in lust at the moment though...but I can't stop messing around with the frames! Bike 1 built this weekend. (UPDATED) I loved seeing Sven when he'd tackle the Spring Classics. He'd attack the pave' and get himself on the front of the race to ensure cameras would see him attack the Kemmel and all the other cobbled climbs. The results never really materialized for Sven on the road in the spring which is why I love seeing him focus so decidedly on MTB since the Olympics last year...proving his dedication to using Dugasts from 32 to, now, 45. Today he crowned himself King Of Belgium, Netherlands and Luxemburg in the 'Lowlands MTB Championships'. What was rad was seeing Dutch National MTB Champ and all around 'cross hard-man Thijs Al take 2nd and other crossers (Stybar, Berden, etc) lay down the gauntlet on the field including some heavies...like Julien Absalon (3rd). All hail the 'crossers! Click the photo below to view the pictures on the day or click here to read the story on www.sport.be (in Dutch....). Use Babelfish or Google to translate. Oh, and what was Sven rolling on today? My 'cross loving sister and camera-carrying soldier in Belgium, Mieke De Cnodder, caught Sven on...ahem...these incredible wheels. Look familiar??? 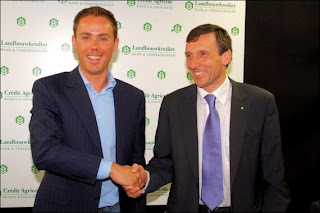 On a press conference today in the building of our main sponsor Landbouwkrediet, it has been officially announced that cyclo-cross rider Sven Nys will join our team in 2009. He will wear our green jersey for the first time in his home grand prix in Baal on New Year's day. We wish Sven, who is the reigning Belgian champion and the number one on the world ranking of cyclo-cross, a lot of success! Sven'll be on his trusted C50 still as his new team are also a Colnago sponsored crew. Isn't that convenient. photo and news source from the team. Unbelievable weekend as you've all read by now. Compton is absolutely sick and deserving of the world cup win....the first by an American. Seeing her last weekend at the Redline and Boulder Cups, my buds and I were drop-jawed at her power. The sand was nothing for her....and literally she rode the entire sections while most the men's pros and 35 opens ran it. Sick. Boom. That was the sound Lars made blowing Sven (his teamate...ha!) and everyone else up. Wellens had a great weekend obviously but Sven was not Nijs this weekend. Totally weird observation. When Sven suffers, he switches his porting technique. Even in total deep mud like today, when he is on song, he ports under the down tube. But when the suffering sets in, he wraps the head tube. Weird. Maybe I'm just a total geek but it's just something I've noticed after watching zillions of hours of Flemish. What did YOU do to get ready for 'cross today> This 3 year old is getting 'er done. ...who are working their Taiwanese manufacturers into the production of some entry level CX bikes. You can see all of the intros for 08 by Colnago and Pinerello in this CyclingNews article, but of particular note is the picture of the cable routing for this cheap(er) Colnago. All top tube! I'm making reference to the post I did on opinions on cable routing found here. Sven's influence is certainly all over this design....vicariously through his influence over the c-50 version of the 'cross bike. I bought all this stuff at the local hardware store for like $20 bucks. I had them cut it there into the section lengths specified above. This is what the 2 and 3 way sections look like (the 2 way on the left, 3 way on the right). 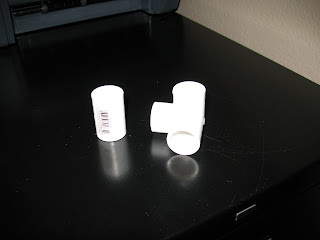 You can find them near the PVC tube section in your hardware store. "The Second Flanders Indoor Cyclo Cross has moved to Hasselt after a successful first edition in the Malines Nekkerhal. The 2nd Flanders Indoor Cyclo Cross in on Thursday 31 January 2008, but will move to the Ethias sand in Hasselt, and will remain there the next 3 years per the organizing crew Promocycling negotiated. The concept started last yere where the racers do two 20 minute heats will remain." I spoke briefly to Chris G about this and we have all it takes to do it here in the Denver Boulder area. There is an NBL league that does this already and we could get some RAD things going on here I am sure. 20 minute heats would be sweet as would a Le Mans start. True story: One year at a DFL, they did the Le Mans start thing. I won the running hole shot but ALL the bikes were laid out in front of us. I did a flying leap over what seemed like two bikes only to land square on some dudes wheel. Sorry dude. Yeah it was a training race but it's urban jungle cross man. I think this would be a marvel concept to add in some barriers etc in a tight format. Advantage to the skilled guys who have had some gate crashing experience (moi). I'll have to do me some thinkin' on this.